Ishant Sharma got things rolling with the wicket of Australian opener Aaron Finch early in the piece. Ishant pitched the ball up, Finch went for the big booming drive and left a big gap between bat and pad. Before the Test series had started, Indian captain Virat Kohli had made it clear that he will not pick up fights and will stick to playing his own game and focusing on his own team. After India were bowled out for 250, the onus was on Indian bowlers to get the team back on track, and they did not disappoint. Ishant Sharma got things rolling with the wicket of Australian opener Aaron Finch early in the piece. Ishant pitched the ball up, Finch went for the big booming drive and left a big gap between bat and pad. The ball took the inside edge and smashed into the stumps. 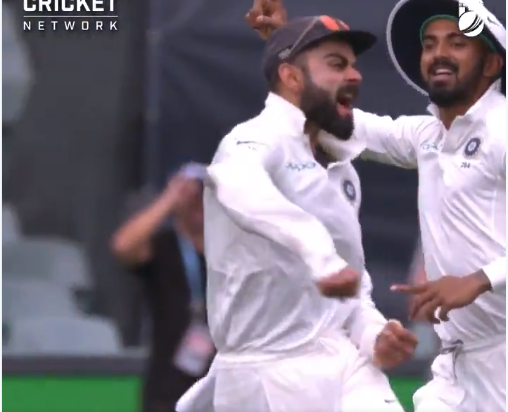 The cameras quickly panned to Virat Kohli, who rushed forward, pumped his hands all over the place and exulted in delight. Sort of a sendoff which really set the tone for the rest of the innings. The Indian bowlers were right on top on a surface which was not entirely conducive to stroke-making. Australia never got going, Ashwin got into good rhythm and got the wickets of Marcus Harris, Shaun Marsh, and Usman Khawaja. Kohli was in his elements and erupted with every wicket. Post the tea break, he made sure Peter Handscomb knew he was under pressure when the Indian captain celebrated right in his face. He then followed it up with another celebration in front of the Australian captain Tim Paine. Quality bowling from Ishant Sharma. "It is not an easy wicket to bat on," Pujara said at the end of first day's play. "I would say it is a decent total because there is enough turn. Ashwin will also come into play. Sometimes when you are seeing it on TV, it doesn't look like it is doing a lot. But when I batted in the first and second sessions, I felt it wasn't easy to bat on and with our fast bowlers, I will share my experience of what line and length to bowl on this pitch," he added.